It's only right that I say thank you to all of you guys, my wonderful followers (I won't let this get too soppy, I promise). Without your comments and loyalty I would (obviously) never have got to this point (wow, bit keen on the brackets this evening aren't I). So, in true blogging fashion, I present you a giveaway - hooray! So, here's what's up for grabs! It's all brand new, all bought with my own money... and I want to keep it all - but I promise I'll part with it for one of you! I stayed true to what I'd buy myself, as I'm hoping you trust my taste / judgement! The watch is so cute isn't it! You can't tell from a still photograph, but the bunnies chase the carrot around the dial! The strap is also stretchy, it'll fit perfectly on anyone's wrist. 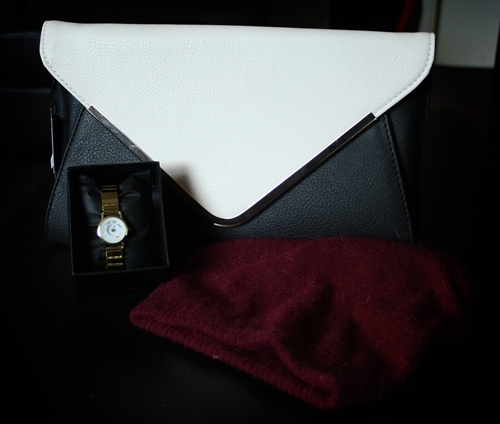 I love monochrome so this cute clutch bag was an easy choice. Monochrome is always on trend too (well, at least in my mind!). And finally, a more on trend / seasonal piece, an angora mix oxblood / berry shade hat - I'm wearing woolly hats all the time at the moment! Ok, onto the bit that matters. Here's the Rafflecopter entry form. You have until midnight on the 16th December to enter! the watch is so cute! Congrats on the followers! You deserve them :-) the watch is soo cute! The watch is adorable! I'd would be perfect to style with anything :) congrats on 500+ followers, well deserved lovely! I would style the watch with a classic white shirt tucked into some high waisted skinny jeans for work. Congratulations on the followers, you definitely deserve them, I love reading your blog :). I love the hat, such a wintery colour!! I think the hat will go with just about anything once it gets cold. I would literally wear this watch 24/7!!!!! It would be styled with everything! Congrats on the 500 followers by the way! Ive been lusting that ASOS watch for ever! I'd wear it with a cute bunny tee or jumper (like the one in Miss Selfridge atm)! I'd style the red beanie with a oversized white t-shirt and some leather trousers. Keep it simple. Or if I want to dress it up I can pair the bag with it and the watch too! :) Congrats on 500 followers! congratulations on the followers :) i would carry the purse whenever i go shopping just to show it off as its so beautiful, i think the purse would match with almost everything. loving the bag - have just the dress to go with it! I would wear the watch with everything - so cute! Adore adore adore the bag. Would look fabulous with anyone's wardrobe! the watch is soo cute! Congrat's lovely, your blog is one of my favourites. You've now made me want a nice cuppa after reading your post! Love the watch! Would look fab with anything! The beanie would go awesomely with black leather trousers, my silver/black spiky skull tshirt and my maroon boots! All the items are great. The watch would go with anything but look especially good teamed with a little black dress for a Christmas party. I would wear it with a beautiful purple dress I got last crimbo, knee high boots and head to the theatre! I love the watch. It is both dressy and casual so can be worn with anything!! I'd style the clutch with a vintage dress, heels, winter coat and vintage jewellery. i love the watch, but im a watchaholic and you can never have too many id wear this with a casual jumper and jeans.. Started following you, looking forward to reading your entries. I love the watch, but the clutch is so cute. I'm a huge fan of monochrome! I would style the clutch with a dress I have which is not too revealing at the front but has a sheer black back. Classy and elegant.